Home > Shop > Black onyx stone smoking pipe Bear style. Black onyx stone smoking pipe Bear style. New item. this Bear style black onyx stone smoking pipe is 3" long. come with free smoking pipe screens. 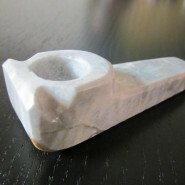 made with natural organic onyx stones with lots of love and care for all pipe smokers spirit around the world. great way to connect pipe smoking to nature. buy me now! and feel the spirit of stone pipes today.